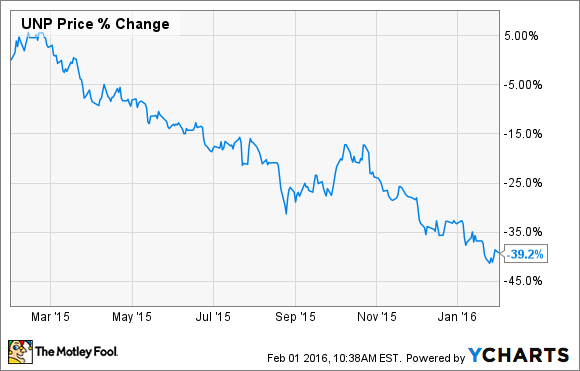 The railroad is facing multiple challenges that could weigh on its share price in 2016. The past year was cruel to Union Pacific (NYSE:UNP). The railroad operator's stock plummeted nearly 40% as plunging energy prices and slowing industrial production took a toll on its results. It appears 2016 may be another difficult year for Union Pacific. Here's why. With the railroads becoming more dependent upon crude oil shipments to fuel growth in recent years, they have also become increasingly exposed to downturns in the energy industry. 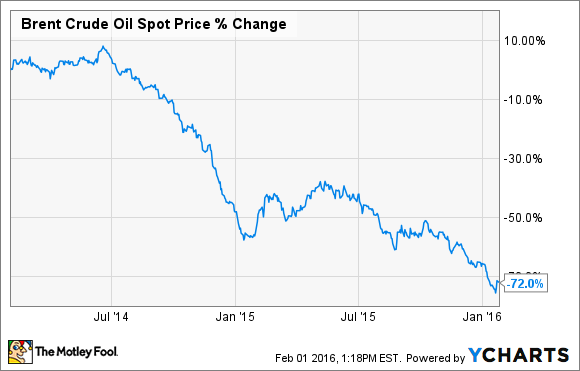 That's made the vicious decline in oil prices over the past year particularly painful. Union Pacific's crude oil shipments plunged 42% year over year in the fourth quarter, and a sharp reduction in rig counts and shale drilling resulted in a 52% decline in frack-sand car loadings. Management expects these trends to continue to affect the railroad's results in the year ahead. "Low crude oil prices and unfavorable spreads will continue to present significant headwinds for crude by rail shipments," said Eric Butler, Union Pacific's vice president of marketing and sales, during the company's fourth-quarter conference call. Fourth-quarter coal revenue dropped 31% to $745 million, as volume fell 22% and average revenue per rail car decreased by 11%. Management anticipates that, like oil shipments, coal demand will remain sluggish in the coming quarters. "We expect the coal market will continue to be dampened by low natural gas prices and high inventory levels," Butler said during the call. But unlike oil prices, which the U.S Energy and Information Administration believes may begin to recover in 2016, there's little hope that coal demand will increase meaningfully in the years ahead. That's because the U.S and many other developed economies are moving away from coal and toward cheaper and cleaner natural gas. This is a long-term trend that will probably weigh on Union Pacific's business for the foreseeable future. Continued strength in the U.S. dollar could also dampen results, as it reduces demand for U.S. exports and, by extension, for Union Pacific's shipping services. That was the case in the fourth quarter, when the strong U.S. dollar -- combined with lower commodity prices and a reduction in energy-related drilling -- helped lead to a 23% decline in revenue for Union Pacific's industrial segment. Management expects more of the same in 2016. "Overall economic conditions, uncertainty in the energy markets, commodity prices, and the strength of the U.S. dollar will continue to have a major impact on our business this year," said CEO Lance Fritz in the company's Q4 earnings press release. Until these macroeconomic headwinds abate, Union Pacific's stock price will probably remain under pressure.